The Memorial Candle Program has been designed to help offset the costs associated with the hosting this Tribute Website in perpetuity. Through the lighting of a memorial candle, your thoughtful gesture will be recorded in the Book of Memories and the proceeds will go directly towards helping ensure that the family and friends of Jesse Beam can continue to memorialize, re-visit, interact with each other and enhance this tribute for future generations. Jesse Scott Beam, 32, of Greenville, passed away on Monday, May 7, 2018. 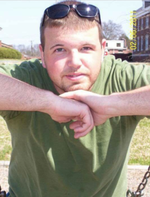 He is survived by his sons; Daulton Beam, Alex Beam, CJ Beam and Ryan Beam, his siblings; Paige Ravan, Kevin Ravan, Brandon Risinger, Michael Risinger and Chris Risinger and his parents Laine Beam-Risinger and Donald Scott Ravan. A celebration of life will be held on Saturday, May 12, 2018 at 2:00 pm at New Life Baptist Church at 2690 W Blue Ridge Dr, Greenville, SC 29611. In lieu of flowers, please donate directly to the Palmetto Mortuary, for Jesse Beam's account. To send flowers to the family of Jesse Scott Beam, please visit our Heartfelt Sympathies Store.